I surveyed that spung 3 years ago, it will be good to see what pops up now. Nothing important was there at that time. Will a fire open up seeds that have been laying dormant in a wet spung? Or will fire just prepare the ground for wind born seeds? Fire opens up the forest floor to sunlight and returns a lot of carbon back to the soil. It also gets rid of a lot of duff, uncovering seeds that may have been there waiting for the competition to get blasted. We walked over 3 miles today looking for a stone and visiting the rock pile again. 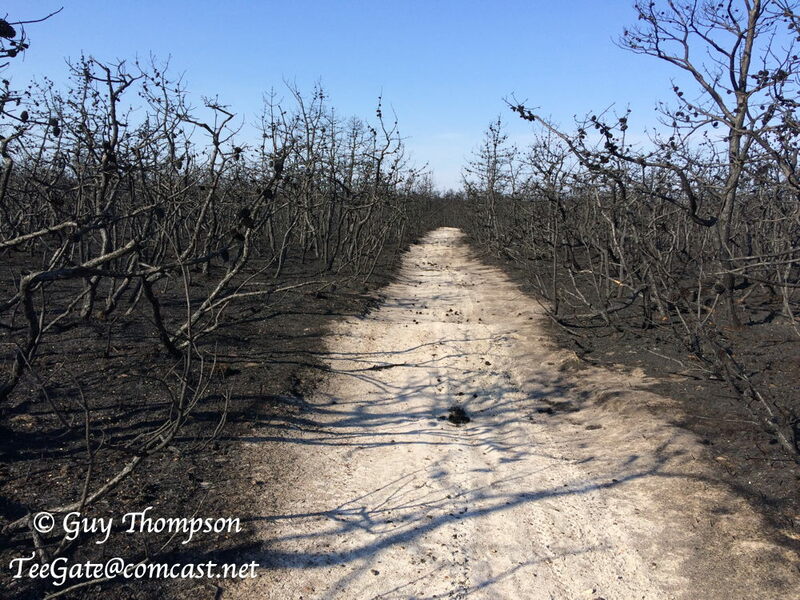 The path we took was the most burned of any we visited this weekend. The plains are a place very few people actually explore and it is like going back in time with the trash and bottles one finds. All of the beer bottles are old as are the car parts, electronics and appliances. As I posted earlier today ... the rock pile. And this may be the same deer posted on a Facebook page and a blog. Not really certain. 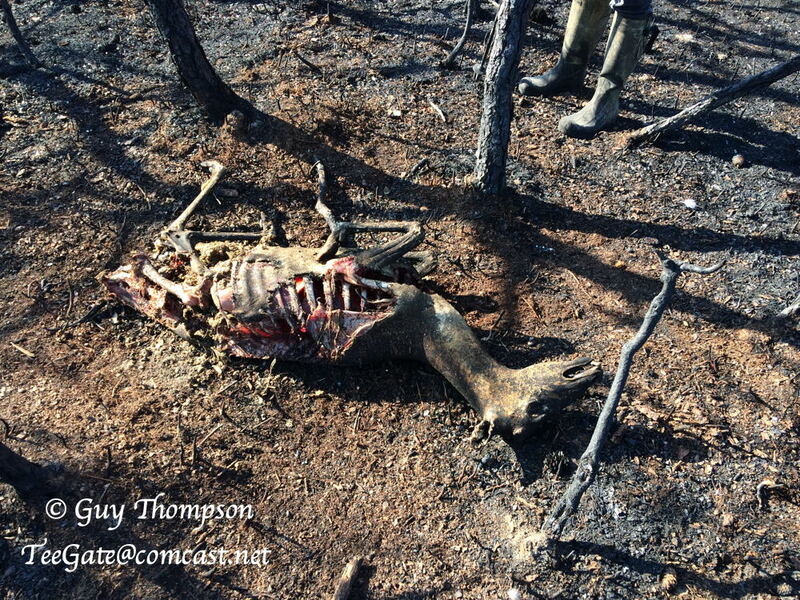 Don't click the link if you don't want to see a burned deer. Finding the stone. 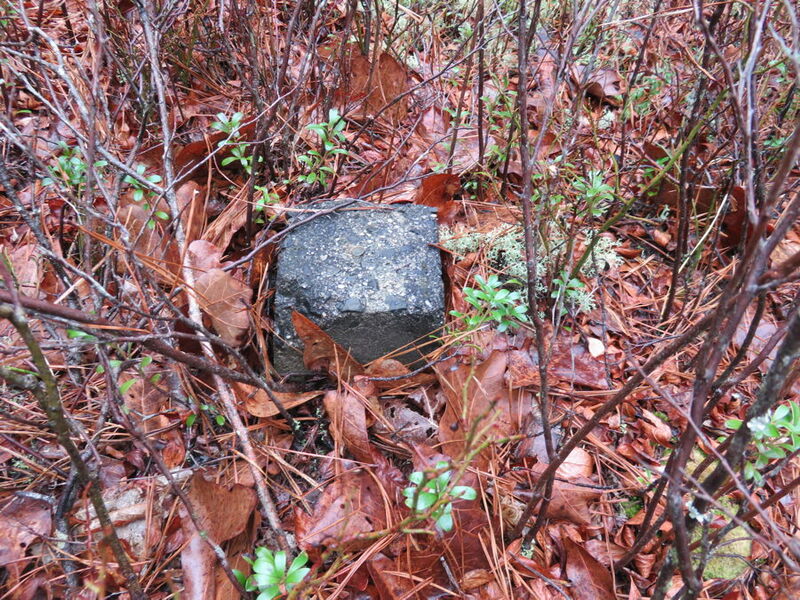 This stone is also part of the Spring Hill Track and may date to 1762 and be part of the "Mine" survey also. It is only 2 inches thick and is just laying there. Imagine a place where it could be there that long and not be intentionally or accidentally moved from that spot. It is just amazing to me. 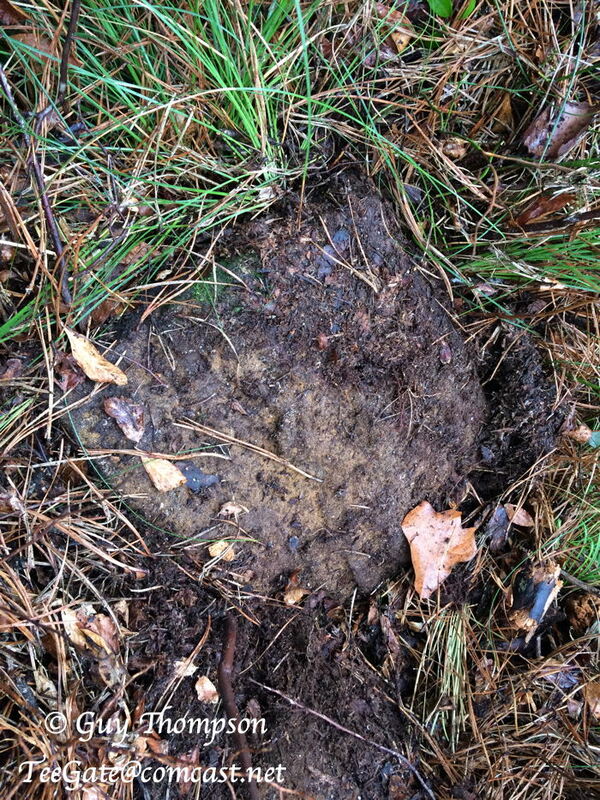 And this stone is 12,230 feet from another corner of the property that we were close to yesterday. The view in the area. If you are interested. A large group of Ford vehicles with others on Sooy Road today. Some from other parts of the country. I fast forwarded the video in spots. manumuskin, Jon Holcombe and bobpbx like this. I saw some of those trucks on 206, I was on my way back from the turnpike. They are Ford F150 Raptors, cost is anywhere from $54K up! Nice truck but not really built for the pines, they are more desert race based, wide stance, etc. Just a quick update. The stones in the video above titled "Burn 2" and "Burn 3" were there in 1820. The property on the north side of it consisted of 4085 acres and was owned by a William Griffith. 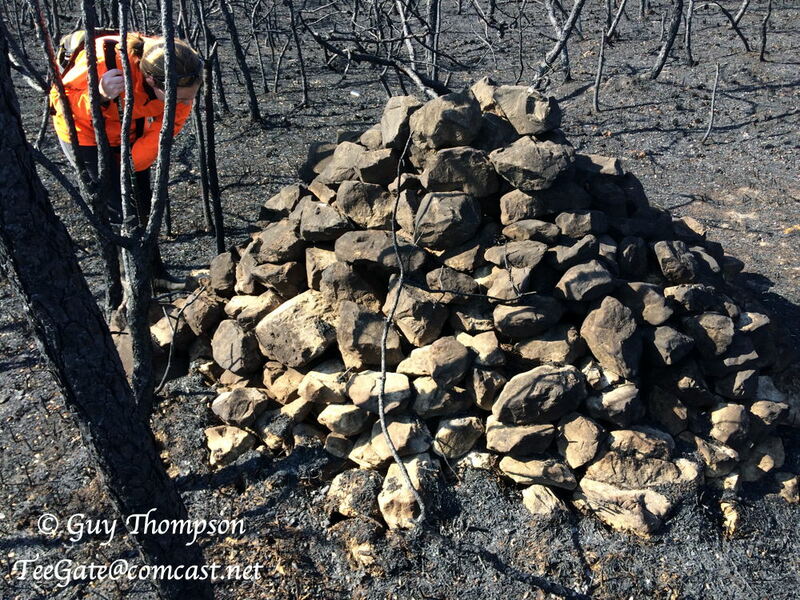 We went today to find two more stones belonging to the Spring Hill Tract that are on the west side of Sooy Road in an area that may or may not have been burned. When we first arrived it was still raining fairly hard but by the time we started walking it has stopped. 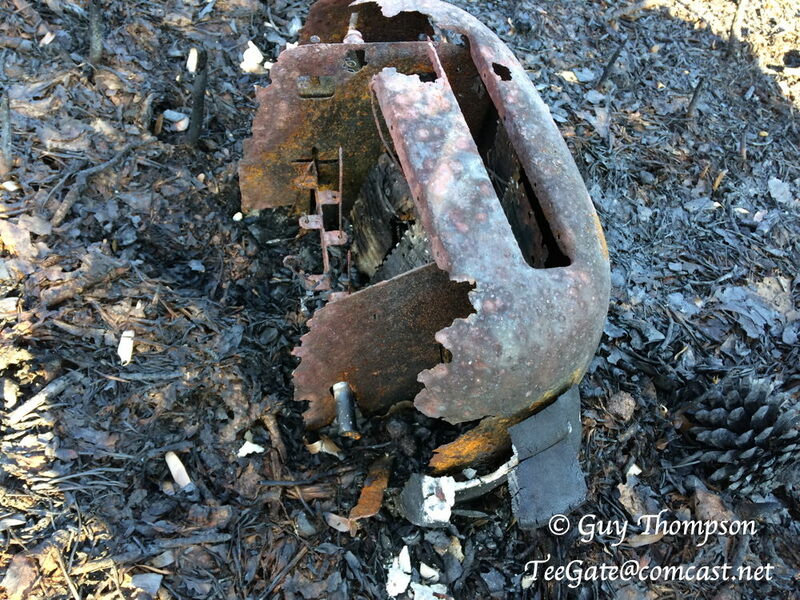 We walked a road on the north side of the Sykes which was burned fairly well but eventually that ended. On the way I was looking for a monument that is on the Jones Mill Tract line which was in the past owned by many individuals and companies with one being Chetwood and also Beers Reality. 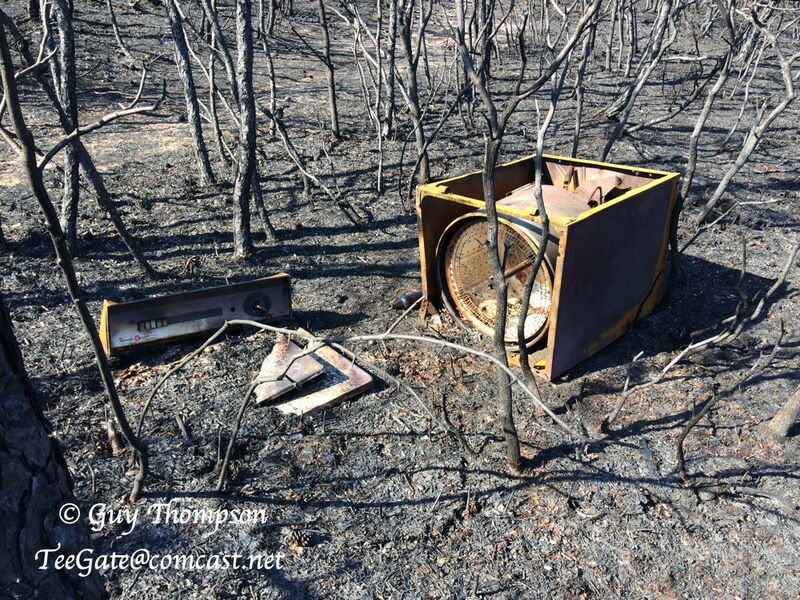 We found it about 200 feet off a road in an area that was not burned. This was where we most likely picked up three ticks that I dug out of myself tonight. Nearby we searched for one of the stones. Walking around is a good way to search because sometimes you can feel the stone under your foot. That is exactly how I found it. And found the stone. This has been here since at least 1820. Next we took a long walk around crossing a bridge to the other side of the Sykes Branch. 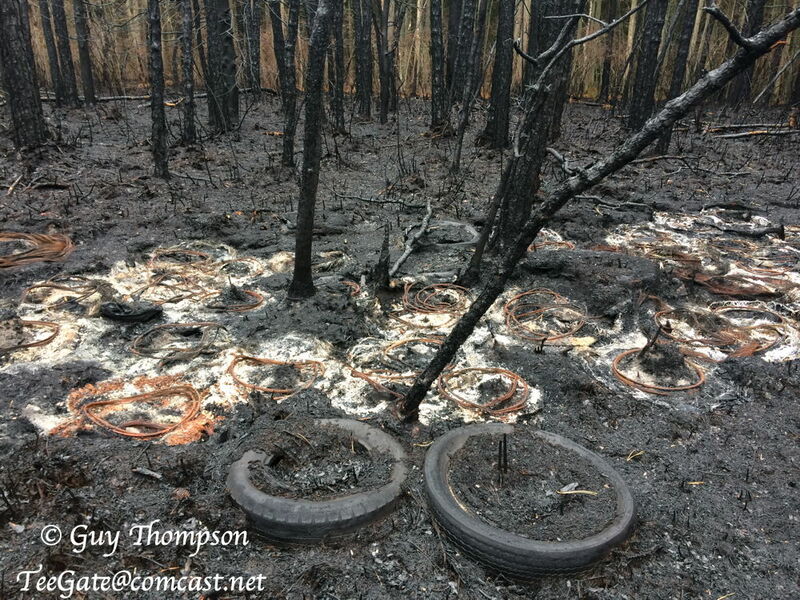 The Sykes stopped the fire from continuing north and west but burned these tires quite well. Except some of them for some reason. 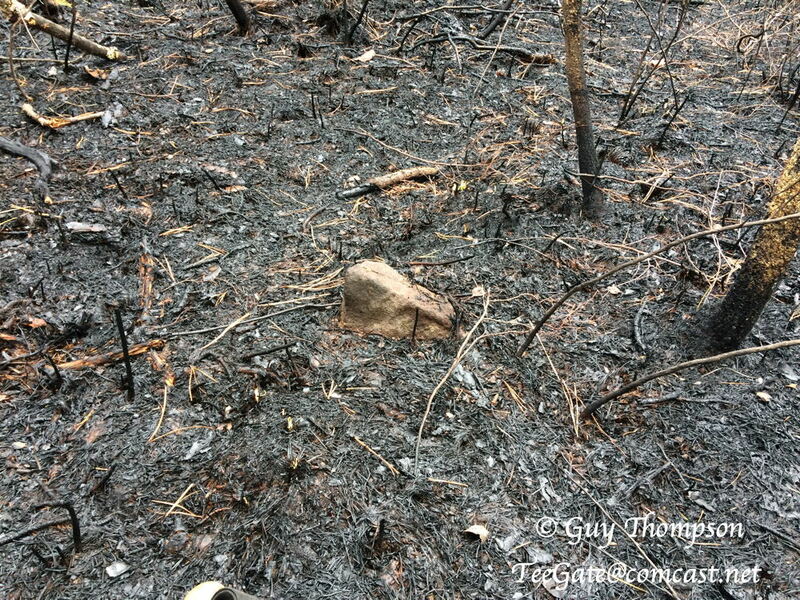 And what MAY be the last stone we need to find in the burn area .......we were lucky enough to find it with no problem. Here is the description from the stone above to this stone which I converted to feet from chains. What is interesting is that the pond they call Decou Pond is NOT the pond that we all know as Decou Pond. This survey calls the pond at this link Decou Pond. Notice right above it has a different idea. In any event ...the stone still there 200 years later. Jon Holcombe, RednekF350, John and 2 others like this. Good stuff Guy! Now I know why there was very black smoke sometimes. Tires really give it off. I am really intrigued by that greenery by the stone. It looks like turkey beard, but it even more looks like it could be a sedge. There was turkey beard all over that area so it might be that. BTW, Jessica was driving out to 72 on Sooy Road and she quickly pulled to the side and I did not know why. There was a state park truck in the road around a corner and a man was cutting the trees that were semi blocking the road. Once done the vehicle came toward us and a woman was driving. So I have to assume they drive the roads looking for trees blocking the road and they cut them. I have it on video in my car and will see if it is appropriate to post. It does not really show him cutting but we could see it. I cut the quality of my videos back to allow more to be stored on the card. BTW, the Spring Hill Tract was purchased by the state on 5/19/1980. It was owned by multiple individuals from Lakewood and Farmingdale. The state paid $1,365,474.76 for all 5 tracts. It also appears that part of the property was acquired by the seller in 1979 when the estate of the "Hyde Park Company" filed for bankruptcy and they took control of a portion of it. I recognize that truck based on the rusted bumper. It's from Bass River SF, but it isn't Maintenance. Maintenance has the good trucks and they don't let anyone else drive them. What you saw was a sign-posting crew, probably using their GPS to locate and mark state property boundaries. If they were cutting a tree, it's because the tree was in their way, nothing more. We had gone down that road previously and there was nothing blocking the road; however, there may have been branches that needed to be trimmed. I forgot to mention that if you travel Sooy Road make sure you are careful near the Sykes Branch. There is a pipe collapsing and it is hard to see until you are right on it. We were walking back to our car and noticed it. If a car or motorcycle hits it there may be some problems. I am unsure if it was right at the Sykes. But it was between or at the streams on either side of this point. To confirm two things mentioned earlier. It sure looks like the state forest vehicle that Guy saw on Sooy Rd was posting new signs. I saw several new signs today. As for the collapse pipe in the road, I saw that last week too, but it's bigger now. Sometime very recent a road grader came down Sooy Rd and made a mess of it, and did a job on the pipe. The pipe is right at the Sykes Branch, right before the many bad puddles. 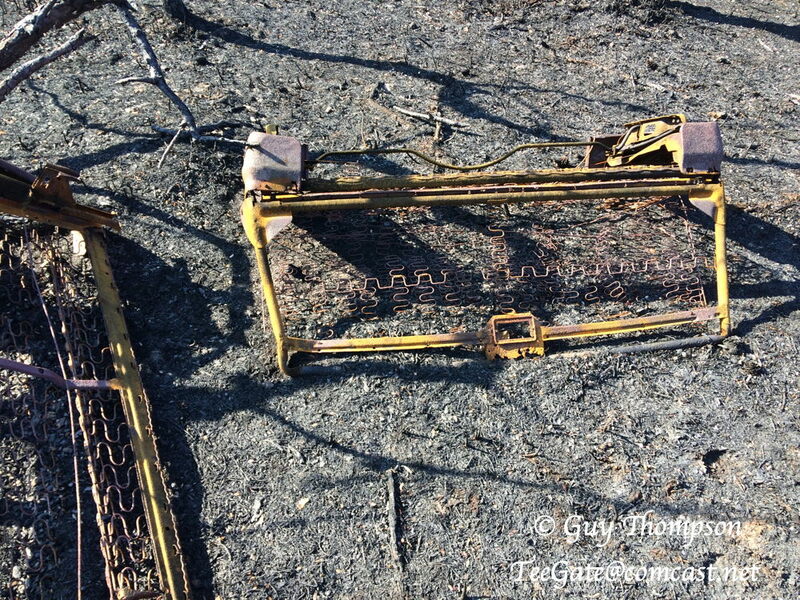 That grader is more recent than last week. I suspect they worked on the Shreve where it crosses Sooy Road. That is 2 feet deep..
Jessica is really sick so I spent the morning and early afternoon exploring around the Sykes Branch by myself. My goal was to find some property corners but there was nothing at the locations I went to for me to see. Some were in the burned area and some were not. The few that were not only brought me a serious number of ticks. I was picking them off me for a couple minutes. Anyway, the property there has gone through various ownership over the years, mainly through death and inheritance. The corners have been elusive for me so today was mainly uneventful. However, I did see a few interesting critters. A painted turtle in a puddle along Sooy Road. Just reached into the puddle as I walked by. And this Black Rat was resting comfortably along a dim road. I laid down and talked to it for a while but it ignored me. And when I was done I looked like this. 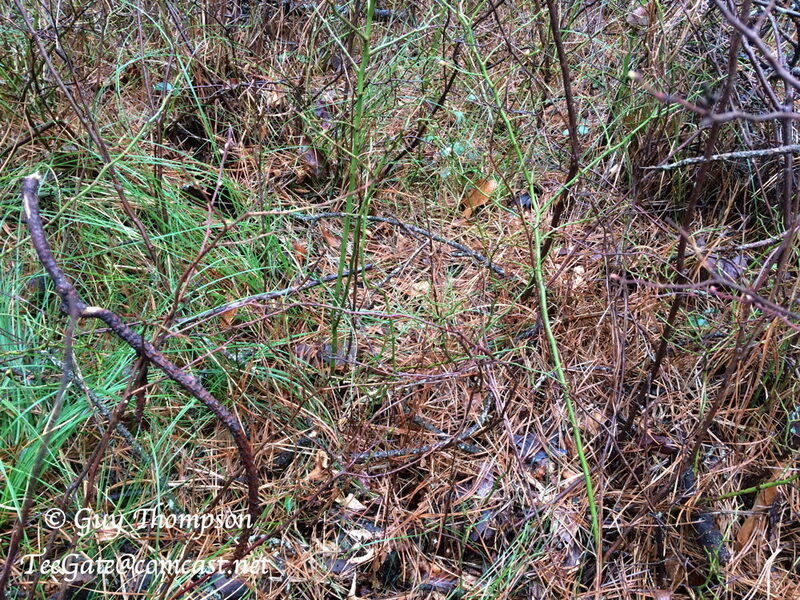 Oh, and I did make it all the way to Haines property and along his line I saw what appeared to be a house in the woods. Closer inspection proved otherwise. manumuskin, Jon Holcombe, John and 1 other person like this.